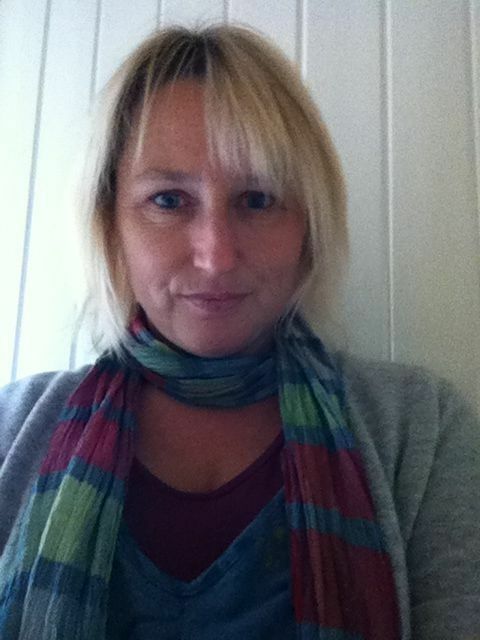 A guest blog from an old friend and colleague from the the other side of the Pennines. 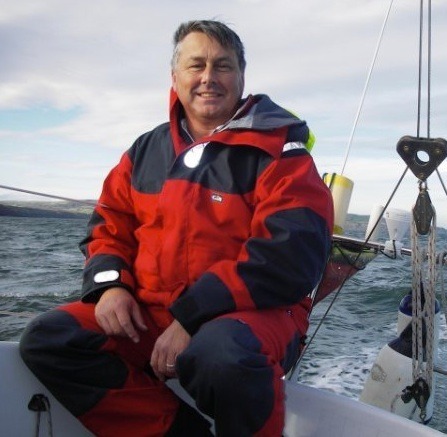 Andy Volans is consultant in Emergency Medicine in the seaside town of Scarborough, Yorkshire. A lovely part of the world with sea, hills, forests, beaches…pretty much everything really. In UK terms it is considered remote (it’s 50 miles to the nearest trauma centre! ), but in reality it’s just a short drive from Virchester. It’s 8pm and a 35 year old female presents to the ED with unilateral facial swelling. A quick look at the computer records show that she has previously been seen with abdominal pain that resulted in admission but settled with observation. You assign the case to one of the junior docs to see in the majors end whilst you are busy in resus. The junior doc pops along and the patient tells her that she feels as though there is a lump in her throat and there is discomfort when breathing. Menstrual cycles are irregular and she has been previously investigated for possible endometriosis, evidence of which was found on laparoscopy the previous year. She is on the oral contraceptive to try and suppress the Endometriosis and regularize the periods. Current medication: NSAID for analgesia prn (recent use) uses salbutamol intermittently when chest feels tight as is presumed mild asthma. HR 95, Sats 98% on air, BP 110/75, RR 15, ECG NSR, nil acute seen. Routine bloods done by Triage nurse: FBC and U&E normal, Blood sugar 5.8. Working on the assumption that this is allergy related, the Junior Doc has given antihistamine (Chlorphenamine 4mg oral) about 2 hours ago as well as 200mg IV Hydrocortisone. Since there has been no improvement, she comes to ask if she should give adrenaline in view of the feeling of discomfort with breathing. At this point you start to worry……. [DDET "What further information might help you make a diagnosis here?”] Further History: The patient has had swelling in the past, often around the face and peripherally and typically around menstruation. It has also been associated with URTI and often a lip swelling closely predates a cold sore eruption. Minor trauma has triggered peripheral swellings. These swellings burn rather than itch and are deep to the skin. If affecting a hand or foot it can make physical activity difficult. Well, Allergy was probably not an unreasonable thing to think of at first. It is after all a common cause of swelling in the ED, but the normal treatments are not working so at this stage we need to stop and think again. If this is allergic then does it make sense? Allergy conditions are triggered by exposure to environmental allergens and involve interaction with Immunoglobulins, either free in the plasma or attached to cells, resulting in the release of histamine from mast cells. Histamine release causes local superficial wheals that itch. If there is generalized release then the patient can suffer hypotension due to vessel dilatation and leakage, as well as bronchospasm and local swelling that can affect the airway. These symptoms can and usually are reversed by the use of adrenaline and antihistamines. Similarly, steroids will suppress the Immunoglobulin production and reduce the chances of recurrent allergic response. That is not what has happened here though. In this patient, antihistamines have not had an effect and if adrenaline was given would we expect any improvement? Probably not as this syndrome is almost certainly mediated via the transmitter, Bradykinin. The clinical differentiation of Histamine based allergy and Bradykinin mediated Angioedema is based on the lack of an identifiable allergic trigger, the burning nature of the pain, the slow progression, with a period of acceleration, the lateralization of the swelling when it first develops and the lack of response to adrenaline and antihistamine and has been described in a recent paper in the European Journal of Emergency Medicine There is a nice algorithm in that paper that we cannot reproduce here for copyright reasons. Diagnostically though as emergency physicians we are interested in differentiating between anaphylaxis/allergy related angioedema and other causes. The approach to this can be somewhat simplified as shown below. [DDE[DDET "What is the clinical history of Angioedema”]1888 Osler described Angioneurotic oedema where the attacks of oedema appeared to be related to a nerve root distribution and were normally unilateral, unlike the generalized “rash” of histamine mediated allergy. He felt that there was evidence that this disorder was inheritable as it ran in families. Depending upon the region affected, the swelling may be described as burning or having a deep itch and often described being painful. Attacks can effect the skin, the face and lips, the larynx and pharynx, the gastrointestinal or genito-urinary tracts. 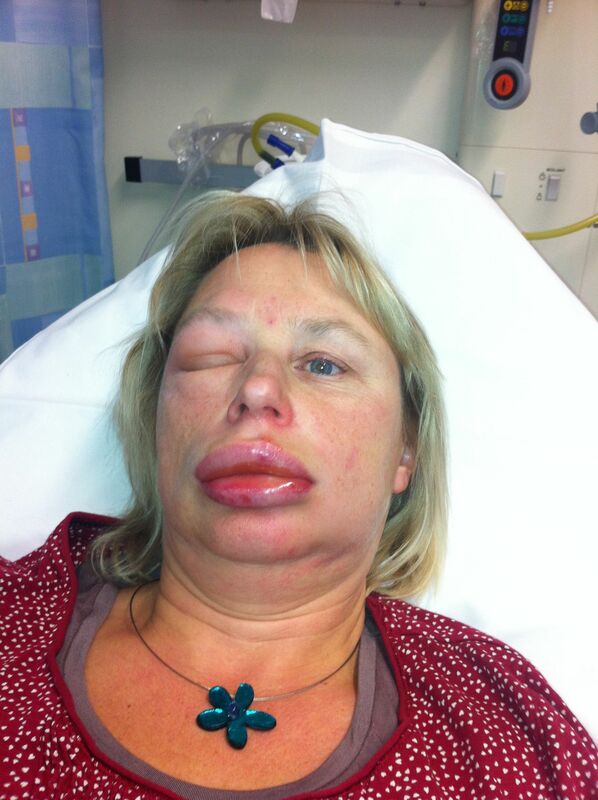 Angioedema is a deep dermal, submucosal or subcutaneous swelling associated with vascular leakage. Patients with a known diagnosis tend to understand their peripheral swellings and so will only present to the Emergency Department when they are suffering an attack that is different, more painful or is life threatening. Consequently, they tend to present with airway compromise or severe abdominal pain. However patients suffering their first attacks may well present to the ED. Facial and pharyngeal attacks are at best disfiguring, preventing the sufferer from working for several days, but they are potentially lethal with 30% of affected families describing airway obstruction deaths in affected family members, often associated with simple URTI. Abdominal attacks present with pain, guarding and vomiting suggesting obstruction. CT scans can show segments of bowel wall thickening with associated peritoneal fluid. Many such patients end up having surgery where there is little found to explain the clinical findings. These patients will eventually settle over 5 to 10 days of supportive therapy. Many of these patients may attend gynaecology clinics with repetitive cyclical pain and may also present with unilateral labial swelling. It is not surprising that many of these patients become labeled, as “irritable bowel” or “dysmenorrhea” and many are not diagnosed as having angioedema for an average of 10 years after their first presentation to a doctor. Bradykinin production is part of the normal inflammatory process of the body. A typical and common example of bradykinin activity is the congestion of the upper airway present during an URTI. Bradykinin is generated on the surface membrane of most endothelial cells by the interaction of Kallikrein and high molecular weight Kininogen that circulate bound together in the plasma. This interaction is initiated by an activated factor XII (which is common to both the clotting and complement cascades). Activated Factor XII converts pre-kallikrein into Kallikrein, which produces bradykinin from Kininogen. Kallikrein also activates Factor XII, driving a positive feedback. Factor XII activation is part of the “Contact Activation” response of the Complement Cascade. The activating entity is a negatively charged surface. In vivo this might be a viral or bacterial surface coat, or various altered proteins such as amyloid or Bence Jones protein as well as articular cartilage, endotoxins and heparin amongst other physiological auto-activation triggers. In the laboratory, Factor XII can be triggered by kaolin (e.g. the KCCT coagulation test). Activated Factor XII activates Factor XI in coagulation cascade, resulting in Thrombin formation. Activated Factor XII is also cleaved by Kallikrein to produce another active form that activates the first step of the Classical Complement cascade (C1 esterase). Kallikrein also activates Complement factors 3 and 5 directly, further driving the classical complement system. Recent studies suggest that these pathways can be triggered selectively although how this occurs is currently unknown. The activated Kininogen cleaves Kallikrein to produce the 9-peptide transmitter Bradykinin. It appears that Factor XII also acts as a physical anchor for the Kallikrein / Kininogen complex, bringing it into close proximity with the membrane bound Bradykinin receptor complexes (Bradykinin 1 (BK1) and Bradykinin 2 (BK2)) The 9-peptide bradykinin binds to the BK2 receptor where it initiates a rapid signal resulting in increased cell permeability and fluid translocation causing local cellular oedema and increased vascular leakage. It also triggers the prostaglandin cascades associated with inflammation and attracting leucocytes to the area. The BK2 activity is terminated by the bradykinin molecule being cleaved by two peptidases in close proximity to the BK2 receptor, one, Angiotensin Converting Enzyme (ACE) breaks the peptide into non active fragments, whereas a second (C1 esterase), carboxypeptidase, within the BK1/2 complex, produces an 8 peptide BK molecule that no longer binds with the BK2 receptor but is recognized by the adjacent BK1 receptor, triggering another interaction that involves the activated BK1 complex being endocytosed resulting in the triggering of slower DNA / RNA mediated cellular changes. These activities are moderated by a number of suppressing factors: The Kininogen and Carboxypeptidase activity and factor XII activation is suppressed by C1 esterase inhibitor (C1inhib) that circulates in the plasma, and as previously described, bradykinin is broken down to non active moieties by ACE which is in close proximity to the BK2 receptor. From this physiology, one can see where some causes of angioedema have their origin. [/lear[/learn_more][learn_more caption=”OK, so what’s the pathophysiology here?”]itary Angioedema (HAE) was described in the 1960’s when a bio marker was identified in the form of a lack of functioning C1 esterase inhibitor (C1inhib) that was transmitted as an autosomal dominant disorder. Two forms of this condition are described. Type 1, making up 85% of such cases, with a pathologically low level of C1 esterase inhibitor protein, and Type 2 (15%) where the protein concentration is near normal but it lacks function. Based on this work, a treatment regimen was developed, using Fresh Frozen Plasma to replace the C1inhib that has now been refined to deliver the isolated plasma derived inhibitor (Cinyrise) or a synthetic inhibitor (Berinert). These traditional HAE types only make up about 1-2% of all cases of Angioedema that present clinically. The vast majority of cases have normal levels and activities of plasma inhibitor when measured during attacks, and so other precipitating causes need to be sought. Allergy related swelling of the upper airway, mediated by histamine, is indeed seen and must not be ignored, and in the early phases of resuscitation should be treated until a more accurate diagnosis can be made. In general, it has a short time scale, an identifiable probable trigger and is responsive to antihistamine and adrenaline treatment. More recently a new type of HAE has been described which is still being delineated. It is most commonly seen in women but not is not exclusively so, it seems to be oestrogen driven and is seen to run in families. Clinically it’s presentation is indistinguishable from traditional HAE other than having a normal C1 inhib level and activity. So far about 20% of these cases have been found to have an abnormal structural form of factor XII but how this abnormality alters its function is as yet unclear. What does appear to be true is that factor XII acts as a more efficient amplifier of bradykinin production and possibly this version of XII is less susceptible to inhibitory factors. It is also known that oestrogen “up regulates” normal and abnormal factor XII activity. Interestingly, we have seen cases of patients on oestrogen therapy for conditions such as prostate cancer present with angioedema and this may be a mechanism for such attacks. Other known causes of “normal inhibitor” angioedema are those patients on ACE inhibitors (ACEI), where up to 2% can suffer from angioedema. Given the incidence of ACE inhibitors in the community, this group will make up a significant number of cases that will present to the ED. The activity of Angiotensin Converting Enzyme is known to vary between individuals by as much as 60%. This might suggest that a patient with a low activity ACE might be more susceptible to ACE Inhibitor associated angioedema when challenged by stimulation to their complement system. Other known causes are autoimmune diseases and haematological malignancies such as lymphoma. It has been recently shown that factor XII is directly activated by contact with unfolded proteins such as Bence Jones and Amyloid suggesting a reason why these diseases may predispose to expression of excess bradykinin production. 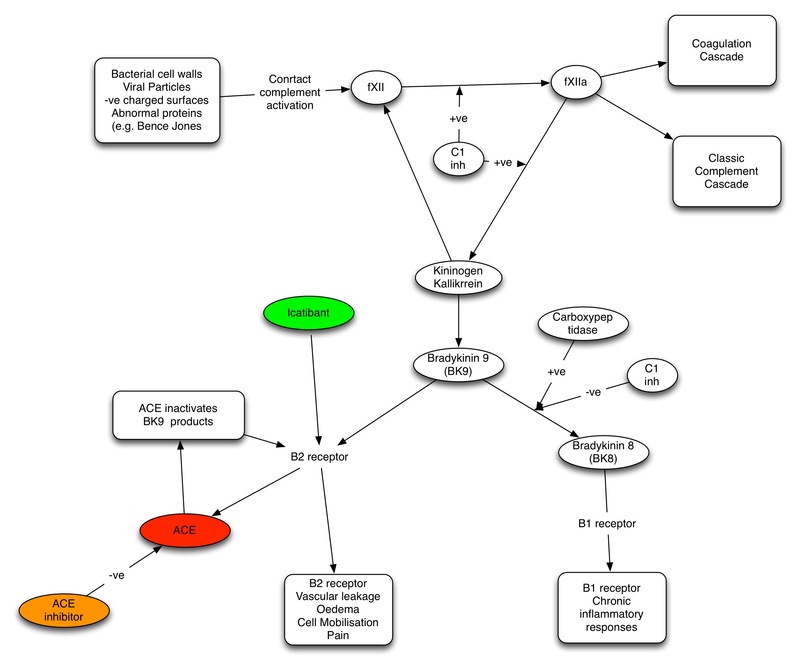 Another route to trigger angioedema is suggested by the fact that some cases of HAE type 1 develop the ability to rapidly denature the exogenous C1inhib by raising antibodies to the protein, consequently an autoimmune disease developing antibodies to C1inhib would be expected to exacerbate the bradkinin response to low level stimulation. 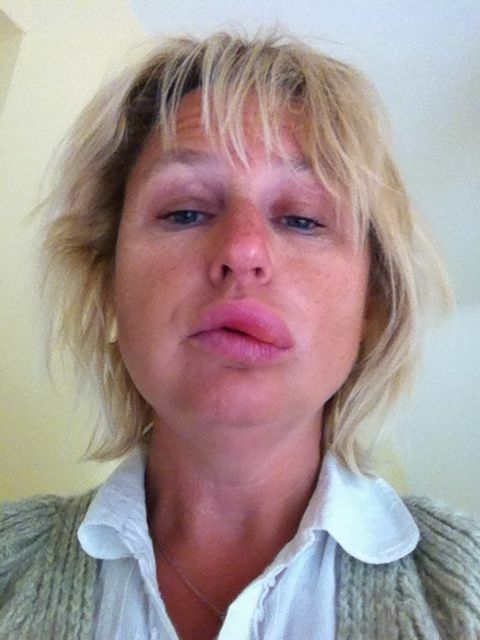 [/DDET[/DDET]p>[DDET [DDET "So how can we treat this?”]o you treat Angioedema? The traditional treatments we, in the ED, routinely use when airway appears compromised by swelling are adrenaline, antihistamines and steroids. Review of the patho-physiology above suggests that steroids and antihistamines are unlikely to be effective. Adrenaline might be expected to be helpful, however experience suggests that the effect is quite small in practice. (personal observation of multiple attacks suffered by my wife and observation of several cases seen in my department) Traditional treatment for HAE types 1 and 2, is the replacement of C1 esterase inhibitor by infusion of Fresh Frozen plasma (FFP) with the potential infection risks of harvested plasma products and the allergy potential of exogenous proteins. Case reports exist showing rapid resolution of attacks of ACEI induced Angioedema using FFP suggesting that replacing both the inhibitor and unblocked plasma ACE removes the bradykinin. The two concentrated C1 esterase inhibitors (nanofiltered, human derived, Cinryse or synthetic, Berinert) are now available and have been shown to be very fast and effective in reversing symptoms. Some HAE patients use regular prophylactic intravenous injections to prevent attacks. Tranexamic acid has been used for decades as prophylaxis for HAE with some reduction in attack frequency and consequently is used in the acute event although studies suggest a slow response to treatment with 20+ hours before resolution. The suggestion is that Tranexamic acid works on the secondary prostaglandin activation or somewhere in the Thrombin pathway. Androgenic steroids have been a traditional treatment as prophylaxis. It has become apparent that where oestrogens increase the amount and activity of factor XII, androgens reduce both the oestrogen level and consequently the stimulation to the factor XII, and also may have a direct suppression effect on Factor XII. The side effects of danozol and stanozolol limit their acceptability as prophylaxis in most patients. But what about the Bradykinin? Since the end organ trigger for angioedema appears to be bradykinin in at least three patient types of angioedema, it would seem logical to consider attempting blocking the Bradykinin receptor. Currently there is a BK2 receptor blocker (Icatibant) in the formulary, which has a license for use in Hereditary Angioedema. Studies also exist supporting it’s use in ACEI associated angioedema. And indeed I have found it very effective in patients with non hereditary angioedema though it is an off licence use of the drug. More recently there has been a Kallikrein inhibitor (Ecallantide) released in the United States but this is currently not licensed in Europe due to poor efficacy and safety reports. [/learn_[/learn_more][learn_more caption=”The bottom line is…..?”]ioedema is more frequent a presentation to Emergency Departments than is commonly thought. (there have been two cases presenting within the last week in a 46,000 new attendance department). New fast and effective, but expensive (£1395 a shot in the UK), treatments now exist. Icatibant at a dose of 30mg sub cut. However, do remember that both Berinet and cinryse come in at £1500 per treatment, Berinet needs 3 vials for a 70kg person at £500 per vial plus is IV so Icatibant is arguably comparable. Known HAE cases need replacement of C1 esterase inhibitor, which now exists in purified form. There is also a new Bradykinin blocker which acts at the end organ directly and can be given as a subcutaneous injection. Lastly, but most importantly. Although this case is hypothetical it is based on very real events and on events very close to the Volans family. St.Emlyn’s and all of us in the blog world would like extend a special thanks to Pip Volans for sharing her story and her photographs. It’s fantastic to share the story and photographs to help others learn about the condition and to support other patients with the condition. Thanks you very much indeed Pip. [DDET [DDET "References”]2010 International consensus algorithm for the diagnosis, therapy and management of hereditary angioedema Bowen et al. Allergy, Asthma & Clinical Immunology 2010, 6:24 Evidence-based recommendations for the therapeutic management of angioedema owing to hereditary C1 inhibitor deficiency: consensus report of an International Working Group. Cicardi M, Bork K, Caballero T, Craig T, Li HH, Longhurst H, Reshef A, Zuraw B on behalf of HAWK (Hereditary Angioedema International Working Group). Allergy 2012; 67: 147–157. My experience with angioedema over the years, almost exclusively due to ACE, is that airway problems are rare. Obviously the soft tissue swelling can be a bit scary in the ED when you’re seeing someone with a swollen mucosa and contemplating the A of ABC. This case series describes using FFP but I didn’t find it particularly convincing from an efficacy perspective. Haven’t looked through references above but a descriptive case series detailing course and outcomes would be a useful addition to the literature. In the paper from the European Journal they make a similar point about the ACE associated ones I.e. rarely cause airway probs. However that does not appear to be the case with the non-ACE associated ones if the family mortality described by Andy is to be believed. I think that’s why there is differentiation in the diagnostic pathway between the two groups. Your mileage may vary? Airway intervention rates of 11% in ACE-induced angioedema previously reported. Certainly under-recognised. While I may suffer from some selective recall, I would estimate at least a quarter of the cases I’ve seen in the last few years have previously presented to the GP or ED and been diagnosed as ‘allergic reaction’. A wonderful overview Simon of a poorly appreciated condition that most of us have seen and dealt with at some point. I still frequently see many doctors give the knee-jerk H1 receptor blockers and steroids for non-histamine mediated angioedmea. I did a BestBet on the specific topic (unpublished) of ACE inhibitor induced angiooedmea and came to the conclusion that there was no strong evidence either way for the use or non-use of steroids and anti-histamines in the treatment (this was simply through the lack of any good quality studies specifically addressing the question). – but this begs the question of what exactly was the true patho-physiology of this subgroup of patients in the retrospective cohort study. 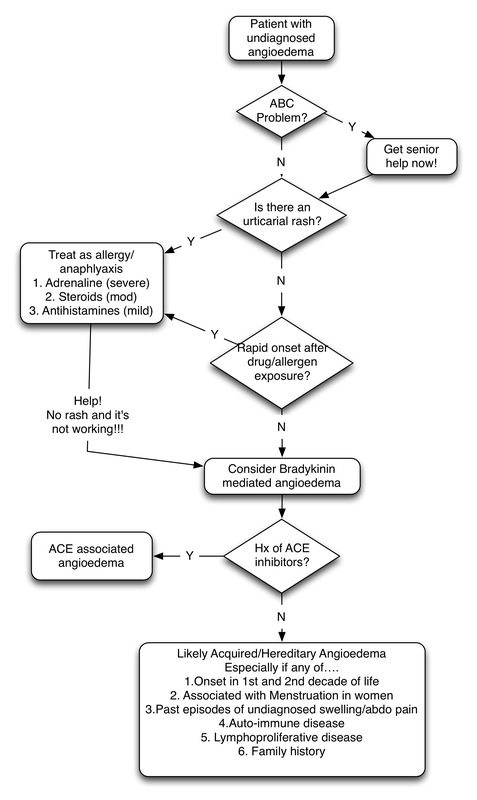 Bradykinin receptor blocker use for ACE inhibitor induced angioedema may be off-licence but I agree it makes sense based on the putative patho-physiology. Hopefully someone somewhere will run and publish a DBRCT to answer the question definitively. Glad to have raised some interest. With my vested interest it has been an interesting experience learning about AE. I have had some hairy experiences in Resus with a few cases and have learned a thing or two watching my wife’s disorder being mistreated by a number of colleagues. The immunologists know a thing or two but rarely see the acute attack. We see the acute attack but haven’t been told of the new treatments, and when they should be used. very important topic to update on! We have a family with HAE and its useful to see the rapid response to Berinert, factor concentrate as well as icatibant. I would now consider a trial of two units of FFP as well. Just was wondering whether you’ve found your answer to the facial swelling and treatment. I have first experienced a facial swelling on the left side of my face maybe four years ago. I run to the dentist thinking that it was an abscess. The x-rays came back clear, there was no pain and the swelling went away probably 24 hours later. I did blood tests – no inflammation, have seen an important allergist. His advice was to continuously take Reactin. He thought it was stress. I was taking it, gained weight as it stops appetite inhibitors, and now take antihistamines when I manifest symptoms. The dermatologist said to take an antihistamine before going to bed when you have an event or a photo shoot the next day. This swelling continues, I get it about once a month, some times every couple of weeks. Either I wake up with it or my cheek starts burning hard and itching and tingling slightly so I know it’s coming. It is always my left cheek. I also get swelling on the right upper side of my nose. Much rarer and much smaller but some times it’s there too. The swelling is hard to the touch. Not rock-hard but harder than the other cheek. If I can compare my cheeck’s swelling to a size of a small apple, the nose one will be more like a grape size. Antihistamines seem to help but the whole ordeal lasts around 24-36 hours every time. No one knows exactly what to do seems like. Please let me know whether you’ve discovered something of value to help your wife. Thanks for your post. I hope things do settle down. Sadly we have taken a decision to not publish patient stories (various legal type reasons) and so whilst the story is very informative we sadly won’t be able to put it up online. I hope you understand and we wish you the best for the future.